Liquid City is the Southeast Asian version of the successful comic series Flight. Both are published by Image Comics. This is the third volume in the series. The theme for this volume is “End of the world”. As a reader, I am disappointed by this latest collection and it’s definitely not one of the comics I would read if this world is coming to an end. There are over 20 contributors to this anthology and the works are as diversified as the Southeast Asia region itself. There are some good stories and art (Disclaimer: I know these two artists personally). Boy by Elvin Ching which is loosely based on the artist’s personal life and experiences. The artwork is great and Elvin clearly knows how to draw well and shows a good understanding of the medium. The Amazing Kelim by Drewscape is another piece that is interesting with a good ending. It’s about a man’s encounter with a strange creature-Kelim. The art is done using calligraphy dip nib and ink which complements the story. But overall, this graphic novel needs to improve on its quality. Quite a few of the pieces seemed to be overly indulgence in their storytelling and I was struggling to read them. The artwork and the storytelling are weak in general and the volume feels like a poorer cousin to the Flight anthology. One suggestion would be tighter control on the quality and cut down on the number of contributors. Hopefully, this will allow the book to have a greater focus on the story and art, which is lacking in this collection. As a showcase on the diversity of Southeast Asian comic artists, I am afraid this volume has its work cut out for it. I had great difficulty reading this book. Compared the first and second volumes, I felt the quality of work dropped. The stories aren't particularly strong, and in some cases I felt that storytelling is incoherent. The only stories that I felt are good are from Aks Kwan, Elvin Chin, Drewscape and Charlie Chan Hock Chye (Sonny Liew's art). It's not because the art is great, but because I at least get what their stories are about. The quality of art really ranges from good to bad. So you get that, blend it with not-so-good storytelling, the result is a mixed bag of short comics good and bad, and unfortunately in this case, many of the stories are easily forgettable. Another thing that annoys me is the commendations from Comic Book Resource who said "Drips with Southeast Asian Comics talent", and Publishers Weekly who said "Imaginative and visually stunning collection of new work". 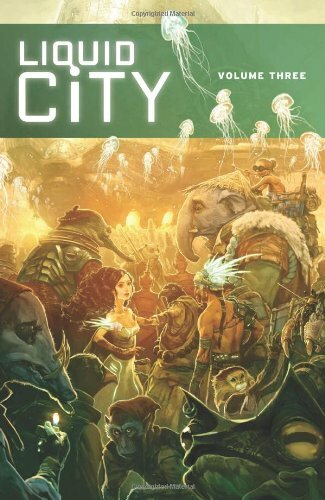 Those were meant for the first volume that was published in 2008, and putting those quotes on the back cover to me is a sort of a misrepresentation, although if you want to talk about technicality, they did mention it's for Liquid City and not Liquid City Volume 3. But for regular people reading those text, they will think it's for volume 3. I only saw that after reading the book, and it's certainly a disconnect for me. While there are a lot of contributors, some of them only contributed splash art pages. Those are pretty good. Usually, when friends come up with their own publications, I would help promote the book to give a bit of support. I've several friends who contributed to this volume. However, I'm not sure if I can recommend this, or who I can recommend to. Oh, I received this book free of charge as a review copy. I seriously hope the quality improves in the next volume, if there is any planned. Editors Sonny Liew and Joyce Sim should have tighter quality control. I'll rate this book 1-2 out of 5 stars.